There are hundreds of different companies that produce earphones. Not all of them are professional. Making great earphones is not as easy as many people think. Audio companies employee audio engineers, product designers and other specialists. This time I will review the HF5 Earphones (Amazon link) – made by the well known Etymotic Research company. The sound quality of the Etymotic Research HF5 earphones is incredible. I met many people that asked me why I buy expensive earphones and headphones, while they can easily order cheap ones online. Many times, I just let these people try my headphones, and that automatically answers their question. Same thing with the HF5 earphones. Their sound quality is amazing, and you won’t find any “cheaper” alternatives out there. In this case – you get what you payed for. Great value for your money. The Etymotic Research HF5 earphones are very comfortable. They come with different ear tips (different sizes) so you can choose the best ones that fit your ears well. You can always buy additional, “premium” ear tips online from companies like Comply (in my opinion they are the best in this field. The quality of they ear tips is just amazing). I do want to mention that in my opinion earphones like Shure SE315 and Westone W10 (Amazon links) are more comfortable and better for sport activities like running and working out. Their cable goes over the ear, and they defiantly stay in your ear no matter what ! These earphones come in 2 colors : Black and Cobalt Blue. I like the blue version more -it looks really nice. These earphones look pretty standard – nothing fancy. And it’s OK with me, not all people need or want earphones that attract too much unwanted attention. In my opinion. 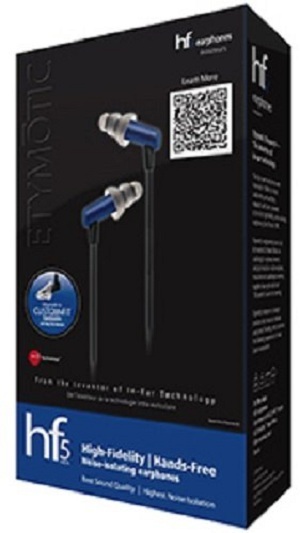 Etymotic Research’s earphones are more about sound quality and less about design. 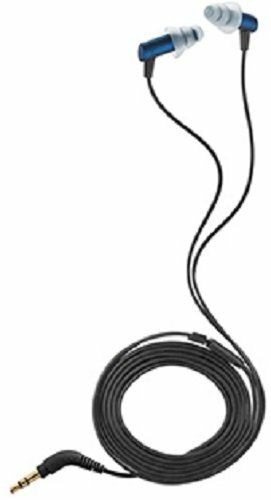 Overall I think the Etymotic Research HF5 in-ear earphones are great and provide great value for the money. The sound quality won’t disappoint you that for sure. The HF5 earphones come with ear tips, wax filters with removal tool, as well as a nice carrying case (pouch). You can connect these earphones to your smartphone of course, but if you have a professional music player (like Fiio X3) – dedinetly use it. You will get the maximum results and sound quality. I hope you will find my Etymotic Research HF5 review helpful. If you have any questions – comment below. Also, check out other reviews on our website like Westone W20.